Suzanne Capone and Cameron Christensen stepped in for Chef Jen. The goal today was to show easy recipes you can easily and quickly cook outside so you don’t have to heat up the kitchen when it’s hot! And use herbs too! Suzanne started the day with a Marinated cucumber salad with tarragon. Thinly slice the cucumbers. Prepare the vinaigrette by combining all the other ingredients. 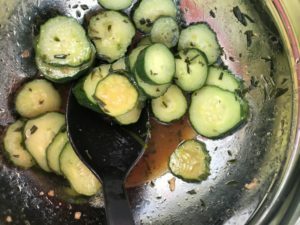 Pour the vinaigrette over the cucumbers and chill well. It’s even better the next day. Slice the squash medium thin. Toss gently with oil, salt and pepper and grill. 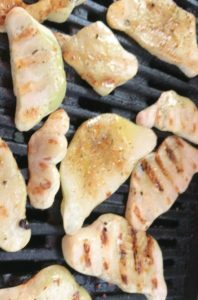 Squash has enough body that you can grill it directly on the grates. Put all the ingredients in a blender and puree. 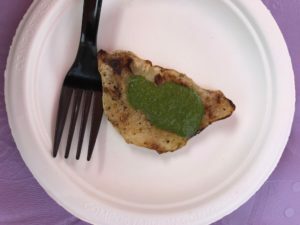 Drizzle the basil sauce on the grilled squash. 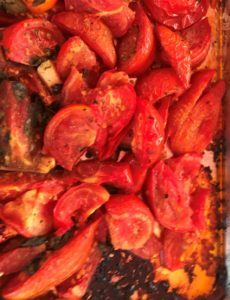 Place tomatoes, herbs and garlic on a roasting pan, place on a medium hot grill( or a 350-400 degree oven), cover and roast for about 30 minutes. Allow to cool. Puree everything with 1/4 cup of milk-Suzanne also added 2 tablespoons of vodka and salt and pepper to taste. Serve with pasta. Fillet chicken breasts and cut into bite sized pieces. Grill until done and enjoy. This entry was posted in Recipes and tagged cooking, fast, recipes, tomato sauce. Bookmark the permalink.